If you read the academic literature on the low volatility anomaly, you find they are focused on the Ang, Hodrick, Xing and Zhang papers of 2006 and 2009. This is funny for a couple reasons. Bob Hodrick was chairman of the Northwestern Finance department when I was there back in 1994, and was completely indifferent to my dissertation on the negative relation between idiosyncratic returns and stock returns. Befitting academics, his subsequent landmark 2006 paper emphasized a new risk factor based on a stock's covariance with volatility innovations. This is standard stochastic discount function asset pricing, looking for more subtle risk factors that could save the paradigm. What they found here was obviously boring because no one mentions that angle, but rather the incidental mention that simple stock variance was hugely negatively related to returns cross-sectionally. Consistent with my earlier experience with Hodrick, I imagine he couldn't accept the result as real or interesting except in the context of some convoluted risk factor explanation, so the seminal academic result had to be packaged as an add-on to a 'legitimate' hypothesis, one now recognized as pointless but was initially essential. Further, once a major pub mentioned it, one could address it without having people simply dismiss it as impossible because, theoretically, it doesn't happen; further, explanations could proceed unbounded, as while the introduction needed the 'risk factor' farcical explanation, secondary ones did not. The fact that low volatility outperforms the average, and higher volatility greatly underperforms, was not an obvious fact in the 1990's even though I tried to explain this to people, though I wasn't working within some accepted theoretical framework, so my fact was not acknowledged. The fact of the negative volatility/idiosyncratic volatility/beta and returns is now legitimate, and around 2005 you had several independent institutional funds operating on the premise, so clearly the fact was in the air independent of Ang, Hodrick, Xing and Zheng. I personally had applied it as a C-corp from 1996 trying to get support, and eventually found a way to a hedge fund where I applied it at that time. Thus, I'm convinced it's not a figment of measurement error because I actually traded it and made money off it, and know people who have large funds that have outperformed their benchmarks applying this insight. The Ang et al papers clearly show that total and idiosyncratic volatility give the same results, so all the focus on idiosyncratic makes the result seem much less robust than it is. Anyway, I was reading a piece on explanations, and this highlighted other pieces, etc. I eventually read through this thread. Most I think are not interesting, though most are well worth reading to make sure. I'm intrigued by the assertion that stocks that have active short interest have a positive risk premium. Obviously, getting all that data together on short interest is non trivial so I'm not sure it's true (I like to see it myself, otherwise I generally don't believe it). These are mainly papers published around 2010 and 2011. "Once we control for future earning shocks, there is no longer a significantly negative relation between idiosyncratic volatility and future stock returns." "we show that the negative relations between returns and idiosyncratic volatility, and returns and turnover volatility, exist only among low coverage stocks." "When short-sale constraints are absent, both idiosyncratic risk and dispersion of analyst forecasts are positively correlated with future abnormal returns for firms with low visibility, consistent with Merton. 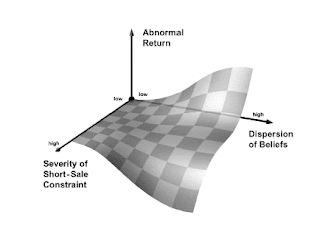 However, stocks with higher analyst dispersion and idiosyncratic volatility have negative abnormal returns when short-sale constraints are present, consistent with Miller." See graph at right for main idea. "Once we extract measurement errors in prices caused by the bid-ask spread we find little evidence in the pricing ability for idiosyncratic volatility. "...the closing price-based idiosyncratic volatility estimate (using the three-factor model) for the developed markets (excluding the U.S.) shows a significant (at 1% level) alpha of -0.926% per month, consistent with the findings of Ang et al. (2009), while the quote midpoint return-based idiosyncratic volatility estimate demonstrates an insignificant alpha of only -0.474% per month." "Since idiosyncratic volatilities are time-varying, the one-month lagged idiosyncratic volatility may not be an appropriate proxy for the expected idiosyncratic volatility of this month....A zero-investment portfolio that is long in the 10% of the highest and short in the 10% of the lowest conditional idiosyncratic volatilities earns a positive return of 1.75% in a month. These findings support the theory prediction that idiosyncratic risk is positively related to expected returns." "stocks with high idiosyncratic volatility and skewness, or lower prices are predominately held and actively traded by retail investors, while institutional investors under-weight those stocks. We also find that the characteristics of the retail clienteles of high RTP (retail trade participation) stocks are very similar to the characteristics of investors who exhibit greater propensity to speculate and gamble as documented in Kumar (2009)...Both approaches show that high RTP stocks have significantly lower average returns." "When sorted first on maximum returns, the equal-weighted return difference between high and low idiosyncratic volatility portfolios is positive and both economically and statistically significant...A slightly different interpretation of our evidence is that extreme positive returns proxy for skewness, and investors exhibit a preference for skewness." "We find that there is a negative (positive) relation between idiosyncratic coskewness and equity returns when idiosyncratic coskewness betas are positive (negative). We construct two idiosyncratic coskewness factors to capture market-wide effect of idiosyncratic coskewness betas. When we control for these two idiosyncratic coskewness factors, the return difference for distress-sorted portfolios becomes insignificant." 10) Have we solved the idiosyncratic volatility puzzle? "On the other hand, explanations based on expected idiosyncratic skewness, maximum daily return, retail trading proportion, one-month return reversal, pre- and post-formation earnings shocks show promise in explaining the puzzle ...Collectively, the above explanations account for roughly 60-80% of the puzzle." "I offer a simple explanation for this phenomenon based on the interpretation of dispersion as a proxy for unpriced information risk arising when asset values are unobservable. The relationship then follows from a general options-pricing result: For a levered firm, expected returns should always decrease with the level of idiosyncratic asset risk." " Strategies based on price momentum, earnings momentum, credit risk, dispersion, idiosyncratic volatility, and capital investments derive their profitability from taking short positions in high credit risk firms that experience deteriorating credit conditions." 13) Can Growth Options Explain the Trend in Idiosyncratic Risk? "Empirically both the level and variance of corporate growth options are significantly related to idiosyncratic volatility. Accounting for growth options eliminates or reverses the trend in aggregate firm-specific risk. These results are robust for different measures of idiosyncratic volatility, different growth option proxies, across exchanges, and through time." 14) Does Idiosyncratic Volatility Proxy for Risk Exposure? "We decompose aggregate market variance into an average correlation component and an average variance component. Only the latter commands a negative price of risk in the cross section of portfolios sorted by idiosyncratic volatility. Portfolios with high (low) idiosyncratic volatility relative to the Fama-French (1993) model have positive (negative) exposures to innovations in average stock variance and therefore lower (higher) expected returns." This reminded me of going back further, where I remember economic historians arguing that urbanization was key to the Enlightenment and the Industrial Revolution, and thereby, to modern civilization. Yet if you read economic history, you'll see that cities have historically been considered genetic sinkholes. Robert Woods estimated that life expectancy was 50% higher in the countryside up to 1800. Even without infant mortality, it's generally assumed medieval cities would have disappeared except for in-migration. 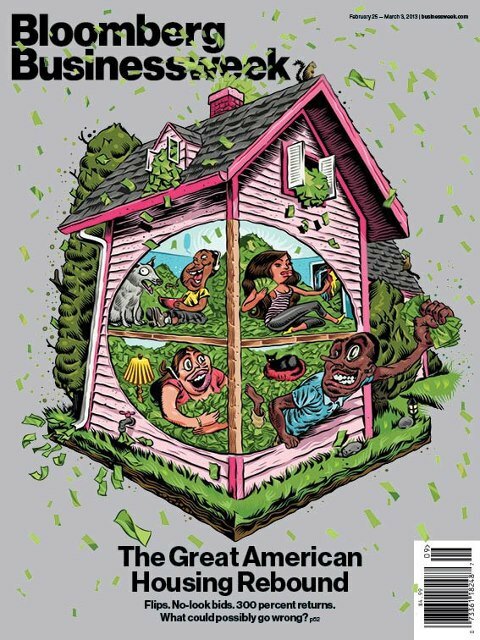 So, why did most people want to move to the city? It seems like the same lure as today: freedom from a set life pattern and higher urban wages. I would like to think people are more motivated by self-actualization that comes from finding one's true niche in life, but looking at pop culture I think it's more simply a desire to socialize with peers (dancing, sleeping around, laughing with friends). 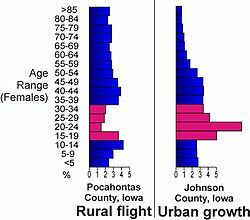 Even today, young people, especially women, flee rural areas for cities (see population density graph above right). For centuries, young people think their best interests are served in a metropolis. So, something generally considered essential for the group, urbanization, was for a millenium harmful to the individual, yet still preferred by the individual. Either people pre-1800 were overconfident about their mortality, oblivious to the statistics, or as Epicurus said, death isn't really something to worry about because if your dead you're not alive to worry about it, and if you are alive to worry you aren't dead so stop worrying. People moving to the city have been illogical risk takers from the beginning. and the key is probably they like the sexual or mating opportunities inherent in large groups. Playing to that angle would bring in hipsters and gays. As to whether that's the key to the health of cities or our nation, I doubt it, but it won't hurt, especially because one of the best ways of making a city fun to go out in is that it's safe for young women. There's an interesting video where several of the world's most esteemed monetary experts got together to honor ex Bank of England Governor Mervyn King, and in the process acknowledged they needed a financial mechanism that affects the general economy. They can't figure it out exactly, they just know finance is very important to the economy. In the meantime, they continue countenance, if not encourage, the persecution of banks. Every quarter there's a new lawsuit brought against the banks. The latest news tonight is about the Libor scandal, which, surely needs punishment, but it's just getting old and the damages are unlimited, so banks are naturally wary. Can we fast track these things? Add to this that regulators are giving banks extra scrutiny for everything they do, and naturally most banks are afraid to lend. Thus, all this new money goes to high powered money that simply pulls in a little interest at the Fed. Here's a set of relevant data. 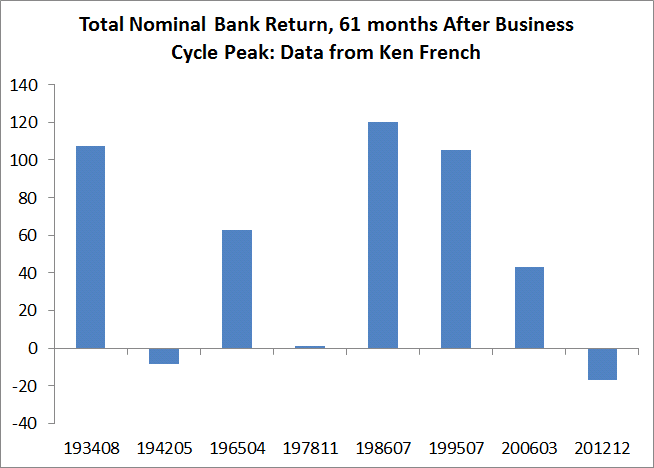 These are data from the bank index through Dec 2012, which I pulled from Ken French's website. 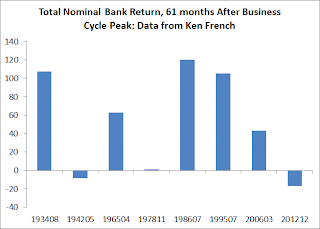 It shows bank stocks at an all-time low at this stage after the last business cycle peak. Banks aren't lending because they are a political punching bag for populists, afraid of regulators and litigators. As Hyman Minsky used to say, you need rich banks. We don't have them. With banks in their negative vega zone, they simply aren't incented to lend. Weak banks aren't a symptom of our weak recovery, but rather the cause. An interesting article in the Feb 2013 Journal of Financial Markets notes the persistent overpricing of Chinese Warrants. Chang, Luo, Shi, and Zhang, all Chinese academics, examined looked at 47 warrants traded on the Shanghai or Shenzhen exchanges, from 2005-2008. The implied volatilities are about 3 times the historical in their dataset; 150% average implied vs. a 50% average historical volatility. Above is an anecdote of how the market price tracks a Black-Scholes price given historical volatility as opposed to the market price (blue is market price, magenta is the model price). It's basically impossible to tell a rational story for the market price. These warrants were all basically options, as they allow continuous creation which allows issuers or other approved institutions to add to supply at at time. As warrants cash settle every day, they make for a popular investment, often with volume far exceeding the underlying equity. It makes one wonder, if there markets are this unhinged from reality, how uncertain China is as a long term investment. I mean, they are doing a lot of things right, but their institutions aren't exactly promoting rational price discovery. It also highlights that preventing shorting is one of the stupider regulations in the world, because without shorts, stupid prices persist a lot longer. On the bright side, they have actually changed the format this year to accommodate fan interest, and moved the 165 pound final to the end of the tournament. This upset some people, but I think there's a balance between catering to the whims of the public via X-game type sports, and modifying your sport to be interesting to more people. The key is, there's a great match between two dominant wrestlers at 165 (Dake and Taylor), so why not have this at the end of the tournament, rather than the typical route, to have the heavyweights last, as they are typically the most boring weight class. I think they should get rid of singlets, riding time next. If you go to Trackwrestling.com, click on the NCAA link and you will see the results from the NCAA wrestling championships in real time, match by match. I had some down time while coaching at our youth state tournament, and volunteered to be a matside scorekeeper. This Trackwrestling software allowed me to score things on a laptop that registered results with a main computer in real time. New matches were queued up automatically (eg, mat 8 has Jones-Smith next, Davis-Johnson in the hole), and were communicated to the wrestlers via a giant screen. Even scoring was helped, as the software wouldn't allow me to mistakenly give an escape point for a wrestler who just made a takedown. The real benefit came from the fact the same software is used to score, communicate, and direct who wrestles whom, where and when, all done automatically. Previously this was a Chinese fire drill, with all the attendant mistakes from dropping sheets, etc. A huge productivity boost. Value and Size are common strategies based on the higher-than-average return to value and small cap stocks, and one can mention the value or size 'factor' that presumably causes this to happen without much explanation. It's a 'risk' factor to many, because small cap and value stocks generate statitical out-performance, which can only persist if there is risk associated with it. As to what the risk of small cap and value stocks is, no one really knows. At first, it was thought to be financial distress risk, but then we discovered such firms have low returns when you measure distress directly, so that's not it. It's not volatility, or beta. While I'm skeptical there's a good risk factor story for value and size, there's something intuitively spookier about value and small caps vs. their opposites, so I wouldn't shut the door on that. Should the anomaly be related to systematic risk, then the excess returns can be viewed as arising from some, as of yet unknown, common risk actor(s). For instance, Merton (1987) offers an explanation for why investors would demand higher returns for taking on higher IVOL. This is funny. 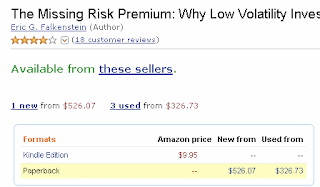 They suggest one theory is that volatility demands a premium because it's risky when it's low (presumably, the CAPM beta holds as well, generating high and low risk to volatility as a factor, which, when you add a preference positive skew and aversion to negative skew, implies a great deal of nuance). Then they reference Merton, who's hypothesized back in the old days (1987) that idiosyncratic volatility was positively related to risk because idiosyncratic volatility should contain a lot of mismeasured risk factors. As a potential taste of why the low volatility anomaly exists, its not promising because it's got the wrong sign. Then they mention Ang, Hodrick, and Xing and Zhang (2009), who note the international dimension of this puzzle suggests perhaps a pervasive risk factor (they were really that tentative) That is, low volatility did relatively well in the 2008 crash, relatively poorly in the 2009 rebound, worldwide, so, it's correlated internationally, which means there's potentially a risk factor that they are all reacting to. Just to be clear, the Low Vol 'risk factor' went down a lot in 2008, and was really high for most of 2009, which I guess means the low vol risk factor is like the two-slit experiment in quantum physics: if you think you understand it, you don't understand it. . I guess they were simply trying to survey prominent outstanding explanations, but I think this is like introducing your new theory on influenza with an overview of the various goblins hypothesized to cause colds. And indeed Li, Sullivan and García-Feijóo prefer their own new theory of market mispricing, which though in working paper since 2010 isn't on the internet, so who knows. Interestingly, while they mention Black (1972), making one think, this is a leverage story, they then mention Wurgler, Baker, and Bradley (2011) and only mention Asness and/or Frazzini and Pedersen in a different context, implying, they really think it's not a leverage story, just some, well, mispricing story that's affected by all the things that keep rational people doing what economists think they should want to do. I'll keep an open mind until I read it. Well, we finally hammered out the problems and so my book is available for sale again, creating a crash that is most surely complicating the Cyprus bailout. I fixed typos and simple mistakes (eg, Against the Odds, vs. Against the Gods), about a dozen or so of them; I'm sure a couple remain. The Kindle version is now in process of incorporating these changes, but the old version will still be available while it's being fixed. There won't be any marks that show it is the 'typo corrected' edition. A well-known commenter suggested I be more open on a subject where I have a strong opinion. He makes the reasonable claim that it's unlikely my single explanation is the only correct one among many, that perhaps the truth is actually a combination of several hypotheses, and further my credibility is dampened by singling out a pet theory, and lastly it causes a biased view of the evidence. It's generally good when discussing a problem to not propose solutions until the problem has been discussed as thoroughly as possible, and only then suggest solutions. Griffin and Tversky find that once we can predict our beliefs, they are basically fixed; if you think there's a 70% chance you will vote for something, then there's an almost certainty you will. This is why juries aren't supposed to discuss a trial until the end, because if you discuss it earlier you will unconsciously favor points that support your initial view. As Eliezer Yudkowsky notes, your wisdom is determined by how you create your beliefs, not how you defend them. Alas, most thoughts are focused unconsciously at the latter. Given that, there's a large cost to having beliefs, because they are difficult to change as a practical matter. 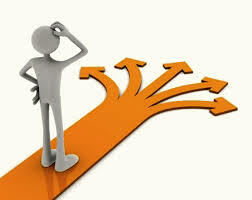 On the other hand, there are many potential theories and facts, and being open to all of them creates indecision. As they say, if you don't know where you are going any road gets you there, but if that's your goal no one will follow you there either. I mean, you can always be a mercenary, someone who does something specific other people find difficult or onerous (eg, an accountant, programmer), but if you want to be a portfolio manager, you need a clear vision to have a chance of succeeding. Doubt is the essence of human consciousness, as our lack of instinct means we often think about what we are doing, why and what to do. It is necessary at least once to doubt all things, but eventually, you have to choose beliefs. Sure, they should be tentative, but more like amendments to the constitution as opposed to annual budget items. My thoughts on the risk premium aren't something I think about cavalierly, things like my thoughts on gay marriage or the what ended the Roman Empire. Rather, it's something I've studied in depth for decades, looking at theory and data. If I didn't have a strong opinion after such a time, you could safely conclude I didn't see anything. Theory is a lens and a blinder, necessarily focusing on some things to the exclusion of others. You need a theory to see. It may be wrong, but unless you take a point of view you'll never know, and everything will remain as it is, a blooming, buzzing confusion. On one level, I appreciate this kind of balanced observation; on another, it's incredibly lame. After amateur wrestling, my favorite sport is MMA and last weekend's bouts were pretty good (winner Georges St. Pierre's face looked pretty beat up). It's good to know the scientists are mining it for data on the human condition. Chimpanzees smile to show submission to higher status males, and it seems we aren't so different. Some psychologists looked at 76 snapshots of fighters in their pre-fight publicity stagings, and found those who smiled more were less effective; losers smiled twice as often as winners. The losers either rationally anticipated losing, or psyched themselves out. Whilst one might think you should smile less to succeed, beware: smiling is associated with happiness and a longer life, quality and quantity. The important difference being that smiles associated with longevity are Duchenne smiles, that is, those that involve the whole face not just the mouth. Basically, if you are truly happy, you smile more and live longer. The smile shown by the losing fighters was the submissive, non-Duchenne smile. Your default should be to smile; but if you feel like forcing a smile before a fight, your odds aren't so good. This is all statistics, mind you: Johny Hendricks smiles a lot in warm-ups, and he wins a lot too. 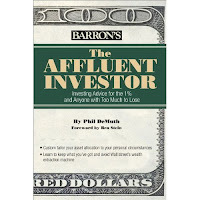 I received a copy of Phil DeMuth's Affluent Investor, which at around $11 is a bargain. Alas, advice books like these, for the layman, are kind of futile, as good advice is ignored by those who need it precisely because those who need it would never seek it. So, it's best as a gift. If there's a 10% chance they can learn, it's worth $11. He seems to be plugged in to the big names in finance, and so co-authored several books with Ben Stein, a well-know author and commentator (and son of famous economist Herb Stein), and seems to know the Peter Bernstein crowd (eg, Black, Scholes) pretty well. 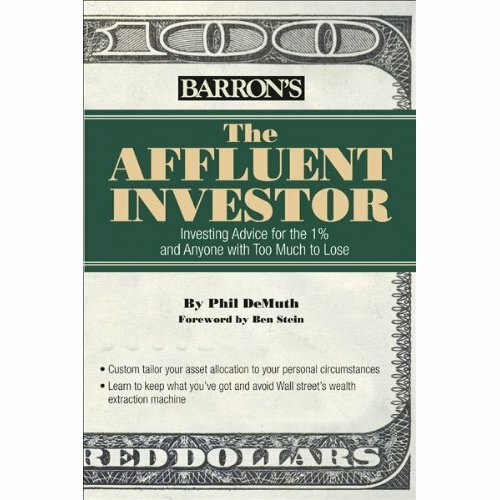 Interestingly his book mentions low-beta investing in a couple of pages, and even includes this blog as charitable reference, which I greatly appreciate. Alas, I don't agree with his portrayal of the low-beta phenomenon. He promotes an alternative history, one consistent with Frazzini and Pedersen's betting-against-beta theory. The basic idea is that low beta stocks outperform high beta stocks on a risk adjusted (but not absolute) basis, and this is because of borrowing constraints. DeMuth mentions Myron Scholes, Peter Bernstein, Perry Mehrling and others, in creating his narrative, that these guys were big early believers in the Frazzini and Pedersen model (before these guys were born), but were thwarted by regulation. That is, all the big players knew low beta stocks outperformed since 1969, and activily advocated levering up low-beta stocks. In practice, however, this aggressive leveraging is hardly, if ever, observed, as a result of which the volatility effect can persist, because people are leverage averse. That is, the big players knew about the low volatility investing anomaly all along (just ask them!). True, Black did show early on why the Security Market Line (SML) is too flat because of borrowing constraints (see Brennan (1971) and Black (1972)) . Facts are important, and Black missed the big one here, which is the SML is flat--not insufficiently upward sloping--but flat (at best). A flat SML doesn't generate a rational reach for high beta that underlies the Frazzini and Pedersen (and Black, Scholes, Mehrling, etc.) model, because you don't prefer the higher returning 1.5 beta stocks if, actually, those stocks don't generate higher returns. That is, 1.5 beta stocks don't outperform 1.0 beta stocks, so saying investors prefer them because they have higher returns means their beliefs are irrational. It's like normal form game where everyone is wrong about the other guy. This is general not considered an equilibrium, and so, back in my day, nonpublishable. Times change. I suppose this is the mainstream academic's (eg, Fama, Campbell) favored explanation. The low volatility (aka low beta) anomaly is not merely that low beta (vol) stocks have higher than expected returns, it's that their returns are higher than average. Just look at the performance of Acadian, Robeco, or Analytic, which have been running low vol funds since 2006ish. If borrowing constraints were key, we would see a risk premium where they are not applicable, such as futures, but we don't. We also see the opposite in options, where the negative risk premium seems simply related to volatility. Saying this is consistent because investors believe they are amplifying positive returns, while in fact they lose something like 20% per expiration, implies an insane dichotomy between expectations and reality. For this reason I think Frazzini and Pedersen or Scholes are wrong to say this all fits in their theory, because their theory is based on everyone acting on a different model than they assume: maximizing returns personally, while assuming everyone else is maximizing variance-adjusted returns. Usually, the dichotomy is someone thinks everyone else is acting irrational, here, the agents act irrational and assume everyone else is rational. In sum, I don't think it's a good explanation now, and historically, Scholes or his colleagues didn't ever discuss the low volatility anomaly for 35 years or so, which makes me think it wasn't something they thought was important, relative to their other ideas over that period. For them to now insinuate they documented the low volatility anomaly back in the 1970's is typical post hoc rationalization you find in regular people. Liberalism clearly hasn't remove the concept of sin, merely changed it. I think that the global warming is a plausible concern, but mainly an overblown pretext for giving more power to governments. Consider that climate alarmists think that there's an amplification effect of around 3 to our CO2, so that the greenhouse effect of the CO2 is multiplied via its effect on water vapor, etc. This would suggest that the climate is in an equilibrium with positive feedbacks, inconsistent with the millions of years of a habitable planet. Clearly our atmosphere has mainly negative feedbacks, because otherwise we would have slid off to Venus or Hoth many millions of years ago via the 1883 eruption of Krakatoa or other climate calamities. Or consider that earth temperature data is measured very imprecisely in prior centuries, often with tree rings. I'm skeptical. Really good data only started about 10 years ago with Argo, where one takes thousands of submersibles and measures the temperature of the sea at various depths. Guess what: no trend. I think it's reasonable to be a skeptic, and not have any petty or political motive, just sincere doubt. In any case, I think sins are like vices, and should apply to actions, so even if you did believe in Global Warming, you should look at actions as opposed to 'thoughts'. It's simply more reasonable to judge people on what they do more than what they say, and Gore's airplanes and ethanol program have put more carbon into the atmosphere than anything I might do. We are not content with negative obedience, nor even with the most abject submission. When finally you surrender to us, it must be of your own free will...It is intolerable to us that an erroneous thought should exist anywhere in the world, however secret and powerless it may be. Uncovered interest rate parity suggests that currency returns should relate to interest rates in a pretty straightforward way. For example, the short-term interest rate in American dollars is about 0.25% and the comparable rate in Australia is 3.0%. According to the uncovered interest rate parity, the Australian dollar should depreciate against the American dollar by approximately 2.8%. Put another way, to convince an investor to invest in Australia when its currency depreciates an expected 2.8%, the Australian dollar interest rate would have to be about 2.8% higher than the American dollar interest rate. On average, however, the high interest rate currencies actually appreciated. If you borrow in low interest rate countries, invest in high interest rate countries, you simply make more money and no one has found a risk metric that might explain this. It's another example of the failure of the risk premium to appear where it should. Here's Marty Eichenbaum in a short interview talking about his NBER paper on this subject. 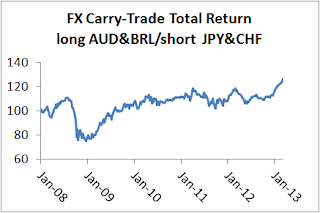 Here I'm simulating the total return to going long the Australian Dollar and Brazilian Real, short the Japanese Yen and Swiss Franc, classic high and low interest rate economies. As one can see, this trade took a really big hit in 2008, but rebounded within a year unlike many other assets. However, since then it's been a boring trade. This year, however, it's been going gangbusters,so perhaps we are back to old times. Curiously, a former definition of impoliteness has become a new focal point for all sorts of political and psychological offense. I remember Miss Manners noting that politeness has two, related, sides: not giving or taking unintentional offense. That's clearly old school. There seems to be a public bounty for perceiving slights, and lots of columnists are full-time commentators noting the latest injustice to their tribe (eg, shocking cover on right). There's a website called MicroAggressions documenting slights felt by people who don't appreciate the guy who opened or failed to open the door for them. 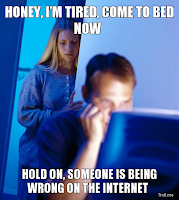 Interestingly, the more they talk about things, the more people get upset by people getting upset ad infinitum. One of my favorite scientists Michael Gazzaniga writes about a study by Kleck and Strenta (1980) that showed how our left-brain interpreter is driven to seek explanations for events. In the study the subjects had a scar applied to their face with makeup, which they observed in a mirror. They were told that they were going to have a discussion with another person, and that the experimenter was interested in whether the other person's behavior would be affected by the subject's scar. The subject was instructed to note any behavior that they thought was a reaction to the scar. At the last moment the experimented said he had to moisturize the scar to prevent it from cracking, and then surreptitiously removed the scar. When shown a video of the other person's facial reaction taken during the discussion, the subjects reported being treated horribly, and noted things like looking away. Their reality was based on two faulty pieces of information: 1) they had a scar and 2) their conversation partner glancing away more than usual. If you give people a good reason to believe someone is biased against them, they will perceive that bias regardless. Unfortunately, no one talks about that study, but rather the more agreeable stereotype threat research that reinforces the notion that institutional racism powerfully discourages groups like blacks, women, and moms, into performing stereotypically The idea here is that if you prime subjects to do poorly on a Raven matrices test, they will conform to the stereotype statistically. A key to good mental health includes the art of not being offended. To do this, you should see that every statement, action and reaction of another human being as the sum result of their total life experience to date, and so it really has very little to do with you. To the extent they are implying you are a knave, fool, or tool, it usually has more to do with them than you, especially in contacts with people one doesn't really know (eg, cops, waiters, teachers). We are often stand-ins, the chess pieces of life to which others have their own built-in reactions. When we provide no Velcro for it to stick, something changes in the world, and most importantly, you aren't brought down thinking about the implications of some poorly thought-out actions. 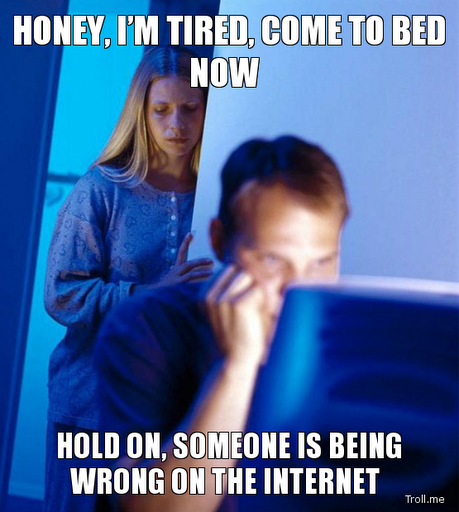 Contemplating or correcting those with bad thoughts is like staying up late trying to make sure no one is wrong on the internet. Though it may take a lifetime of practice, a thick skin is truly one of the best kept secrets for living a happy life. Unfortunately, people today are taught the opposite, to find slights based on whatever angle gives them their greatest insecurity or platform, which somehow will bring justice to the world. It's really a bad meme, counterproductive for the individual and society. Is Tampa Pension Fund Manager the Real Deal? Jay Bowen's stock picking has made the Tampa Firefighters and Police Officers Pension Fund one of the best-performing public pensions in the U.S.... As of Dec. 31, Mr. Bowen's annual returns beat pension giant Calpers—which employs 125 consultants and 1,100 money managers—over three-year, five-year and 10-year spans. ...The Tampa fund appears to be well funded at about 90%. It uses an unusually high annual investment target and discount rate of 10% to calculate the present value of benefits owed to retirees. The fact that a particular manager has generated above average returns over the past 10 years is not an anomaly, but rather, a statistical certainty. Given Tampa discounts their liabilities by 10%, implying an expected return of 7% or so, I suspect that statistical logic isn't their strong suit, so they simply see this case in isolation, and infer his return based on what looks to them like a long track record, over ten years. As the housing bubble showed, you can't argue against someone who has outperformed over the past 10 years, so I'm sure they are going with their rosy assumption, which I bet will fail with a high probability. This reminds me of a sales pitch a neighbor broker once told me about. He would take his clients to lunch or dinner, and tell them a long, happy tail about an old client of his firm who had simply put away a modest amount in a company they recommended for over 20 years, and by the time she retired, she had tens of millions of dollars and spent most of her time on charity. This fantasy was very appealing because it really happened, as Home Depot was one of those stocks that went up 100 fold over its lifetime. Further, doling out charity is a great way to enjoy high status in your golden years without guilt: it's something the non-rich simply can't do or criticize. Of course, for every lady like this, there were thousands who didn't do nearly as well, but only a cynic would conclude such cases were impossible. 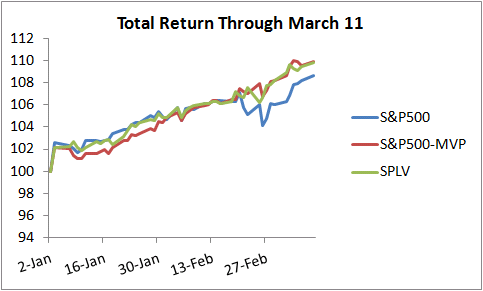 In this year's bull market, low beta portfolios have been doing quite well. 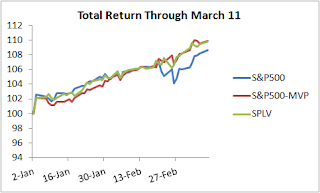 My own Minimum Variance Portfolio, taken using 50 constituents of the SP500, has outperformed the SP500 by just about the same amount as the SPLV ETF (which takes the 100 stocks with the lowest volatility). It seems that low beta portfolios were insulated against that mini bear market of a couple weeks ago. Though I have not the slightest itch to murder anyone, I do read some obituaries with pleasure. Hugo Chavez was a typical tyrant, and I would surely want to emigrate if I ever found myself in such a country. Yet, many on the left disagree and point out the trains ran on time. Salon has an article entitled "Hugo Chavez's economic miracle," and highlights that the official poverty rate fell during his tenure. I'm skeptical of poverty statistics calculated in countries run by dictators, especially those countries where the murder rate is 4 times that of Mexico. I guess we probably do not agree on the facts, but I also suspect we have different preferences. 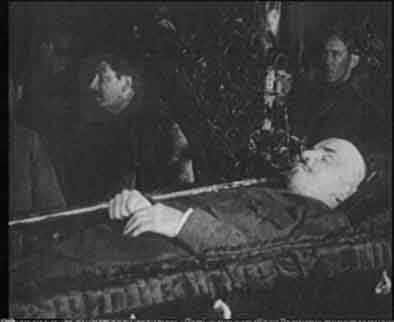 Luckily for them, Chavez is going to be embalmed like his hero Lenin, and I'm glad there's a shrine to people I disagree with so far away from me. I wish one of his Western cheerleaders wouldn't merely praise these guys, but actually move there. That is, if Cuba, Venezuela, China, or Albania is a socialist paradise, then why don't any of these guys actually want to live there. Why Do Top Income Shares Matter? He's a pretty conventional, leading academic economist. It's interesting that he can say this as if it's not debatable and move on, because if this is true, many of the fundamental results of economics are simply wrong. For example, there is no risk premium, a theme of my now back ordered book, which discusses why this inconsistency persists. Yet, I'm pretty much alone in arguing this in finance. In other words, in some fields of economics relative utility is obvious, in others it's applied piecemeal, in others it is not used at all . Such is the science of economics. Some note that if we are in bull markets, it is better to be in high beta stocks. I would agree that if you know you are in a bull market--that is, you know the stock market will be up at the end of this month--then it is preferable to be in high beta stocks. Yet, implementing this timing rule is not straightforward because even abstracting from the variance drag of high volatility stocks, the dominance of low vs. high beta changes whether you are using contemporaneous or ex ante indicators. That is, it makes a big difference if you use data from today to determine tomorrow's portfolio, or data from tomorrow night. Low vol, is pretty much like low beta. and betas are actually pretty straightforward to predict. Low beta stocks move lesss than high beta stocks. 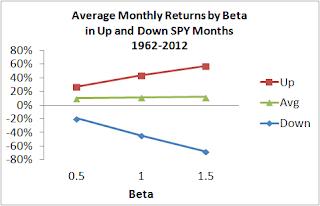 In up markets, low beta stocks go up less than the average, and much less than the high beta stocks. In down markets, low beta stocks go down less than high beta stocks. 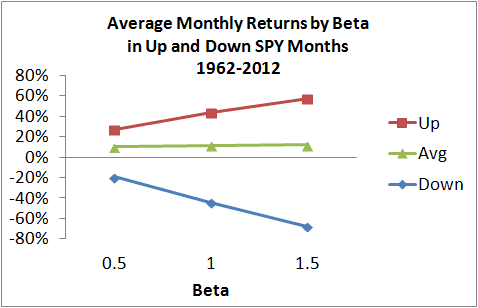 Here's my data on beta portfolios since 1962 using monthly data, using the separation of whether the contemporaneous S&P return that month was up or down. Bottom line: if you know markets are going up, go into high beta stocks. Now, what about volatility? In above average volatility using the same, ex post, end of month datapoint, one finds that in the tranquil, below average volatility months, markets rise and higher beta stocks dominate; in higher-than-average volatility it's better to be in low beta stocks. We know that monthly returns are pretty uncorrelated, yet, monthly volatility is highly correlated, and so, perhaps, low volatility periods are better for high volatility stocks?! Alas, no. Looking forward, it goes the other way. That is, using last month's volatily, lower-than-average vol means it's better to be in low volatility, and the opposite in high volatility regimes. My book is currently 'out of print' because I'm simply trying to correct some typos, and my publisher does not allow printing while a text is being corrected. I currently have 3 simple syntax correction in the queue (eg, change a comma to a period). I'll get back this change in 5 business days, and if all goes correctly I'll be up in three weeks. Otherwise, it will take another 3 weeks and we continue. If you want to self publish a book that has equations, expect the process to be very difficult. Equations, pictures, and Symbol fonts, are unconventional. For example, on several occasions I've tried to explain what a β is, and it's exasperating; think about getting an inline equation correctly formatted. They take my changes and send them over to India, and as one can imagine it's a clusterpuck of miscommunication. First, they try to put all the request into a protocol that is completely documented, but alas none of my comments fit into their pre-fit categories, and they generates tons of automated respones that convey no information other than 'we received your comment.' I can't talk to those guys actually making the changes often (I did on my latest round, strangely), so no matter how much I talk to the American sending this off, it's all pretty much irrelevant because 12k miles away, that conversation doesn't count for anything. Most times I receive back my changes and they include changes to other parts of the book I didn't ask for. This is because when they transfer the book to other formats, the gifs or Symbol fonts don't carry over and so look like I want to change the formatting to some incomprehensible giberish known only to me, but also because they compare to a version I sent their prior to the latest one.